Flying Saucer Attack - "Mirror"
From it's wildly psychedelic, mirror ball cover and inner-sleeve art featuring wobbling flying saucers careening over a churning ocean filled with rainbows, pink rabbits, and sea monsters, we know we're in for something different this time from Flying Saucer Attack. On Mirror, Dave Pearce both gets back to his roots, and takes giant steps forward, producing his most extroverted and accessible album to date. Space (1999) kicks things off with white noise fuzz and phased acoustic-slide guitar. Pearce's vocals are mellow and melodic. Suncatcher may be FSA's simplest, and most beautiful piece. Drawing on English folk, the purely acoustic guitar piece allows Pearce's vocals into the foreground, making them as clear as they've ever been. Slightly less laid-back than the first two tracks, Islands picks up the pace a little with a knocking beat, and a throbbing bass carrying eddies of atmospheric noise along for the ride, a ride which builds in intensity, with a distant, march-like rhythm and edgy waves of feedback that begin to shriek, surreptitiously taking over the piece. The music is dramatic and deep. The thematically related Tides is another acoustic ballad with a thin strand of whispery electronic squeal running through it like a ghostly thread tying together the guitar notes. With its throbbing electronic rhythm, crunching beat, and processed vocals, Chemicals brings some of New Lands' darker, industrial edge to Mirror. Dark Wind is a richly ambient piece with undulating waves of sound blown by soft electronic winds, a rapid, mutating beat and strumming acoustic guitars fading in and out in the background. Pearce dips his fingers into the electronica scene with the pulsating tinny dance beats of Wintersong. His vocals are at their most aggressive here, though they still bear that somnambulant quality they always have. It's as if he's just woken up from a dream and has to sing about it. 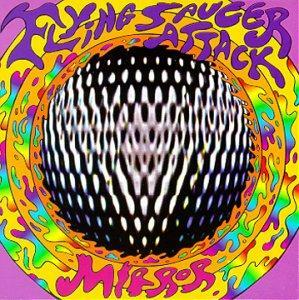 River rocks out, with a driving beat and fuzzed guitar riffing, sounding closer to the earliest FSA here than anywhere else on Mirror, but with feedback that is much more controlled that on the early works. Dust is the strongest piece on an already strong album. Its sharp but playful rhythm buoys moody acoustic guitar plucking and mysterious, hypnotic vocals, highlighted by subtle, bluesy electric guitar. Contrasting that, Rise has a metallic, jarring rhythm, balanced by a mellow, grooving bassline and smooth washes of electronic ambience and slowly swaying vocals. Star City closes the album on an odd note, thudding along with a muted scraping sound behind the melody, finally dissolving into a sea of white noise, similar to that which opened Mirror, so I guess it brings the listener full circle. So is this the masterpiece that Further was? Not quite. Further was a far more focussed effort, assured of what it was in almost every way. On Mirror, Pearce is unfolding his wings. With his Flying Saucer now grounded, he's looking for new ways to fly, and new dimensions of sound to explore. Pearce himself felt that this album recaptured a bit of the spirit of the early FSA recordings. I think what it's capturing from those early sessions is the sense of trying out new ideas. The album may mark the end of Flying Saucer Attack, but also heralds the beginning of things to come from the creative mind of Dave Pearce. More information can be found about Flying Saucer Attack on the web at: http://www.dsl.org/fsa/. You can subscribe to the FSA mailing list at: http://www.topica.com/lists/fsa-list. Mirror is distributed by Drag City. You can visit their web site.